During World War 2, a cross channel duel between the Nazis and Great Britain developed, with both sides places number of large guns on either side of the channel, with the mission to bombard shipping and the either side of the channel. With the fall of France to the Germans, guns were quickly installed at Calais as part of the preparations for the invasion of the British Isles; 14 guns were eventually installed on the French side of the coast. Initially, Britain did not have a responses for this threat posed by the Nazi guns until after a visit to the area by Winston Churchill when he was enraged to see enemy shipping using the channel unhindered and he subsequently ordered the installed of two 14″ Naval guns at St Margaret’s. Other than boosting moral, these proved to be slow and ineffectual and a further three batteries were installed at South Foreland, Fan Bay and Wanstone. These gun batteries formed part of the coastal defence network in the months after the Allied evacuation from Dunkirk – by June 1940 the Dover Strait and the White Cliffs had become Britain’s front line in the Second World War. These batteries would ultimately help to close the Channel to enemy shipping and deter invasion. One such battery that was established on the cliff tops in Dover was the Fan Bay Battery, which housed three BL 6-inch (152 mm) Mk VII guns to fire upon the German positions and was manned by the four officers and 185 men of the 540th Coast Regiment. In order to protect the regiment manning the guns, tunnels were carved out of the chalk cliffs at a depth of 23m to serve as a Deep Shelter. These were constructed in just 100 days by Royal Engineers from the 172nd Tunnelling Company. Construction of the Fan Bay battery began on 20 November 1940, and the site became fully operational on 28 February 1941. 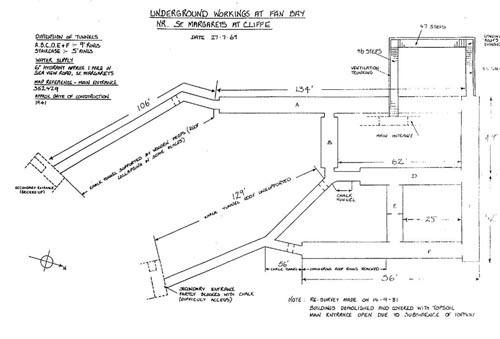 The tunnels followed a familiar construction pattern to other Dover gun battery shelters, with concrete staircases leading deep down below the headland surface to a bomb-proof irregular grid of tunnels formed by a vaulted lining of corrugated steel supported by colliery-type hoops. Mechanical ventilation was provided by galvanised steel overhead ducts, mesh wrapped to take a coating of now missing insulation material. 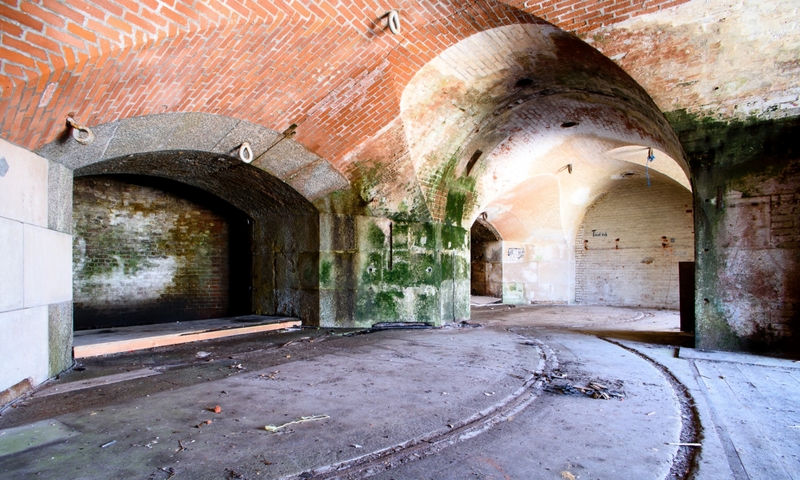 The tunnels were abandoned during the 1950s and the entrances were covered over and all surface buildings demolished in the 1970s as part of the Operation Eyesore project to remove the derelict coastal defences around Dover. Only restricted access has been feasible in recent years, but all changed when the National Trust bought the site in 2012 and a programme of restoration began assisted by the Kent Underground Research Group and other volunteers. The original entrance and a generator room were uncovered, 30 tonnes of spoil were removed from the stairs and a further 100 tonnes from the galleries, and then finally the collapsed tunnels to the sound mirrors, and the mirrors themselves, were re-excavated. The tunnels were reopened in 2015.